We understand the critical role your IT infrastructure plays in your business which is why we offer our business customers fast, affordable solutions for all of your IT needs. Franktronics is an authorized re-seller of Lenovo personal computers. We chose Lenovo for their quality and support to ensure you will be happy with your new computer. Our new computers come with Intel Core i3, i5, and i7 processors to provide the performance you desire. Our ThinkCentre desktops, ThinkPad laptops, TinkCentre all-in-ones, and and Yoga tablets come fully set up and ready to use. We’ll even transfer data from your old computer, FOR FREE. All warranty and support is handled right in our office. Read more about the computer systems we offer. Read more about our Business Servers. 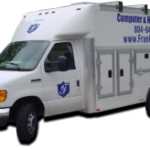 If your computer is running slow, has pop-ups and advertisements, Blue Screens, or simply won’t power on or boot up, Franktronics is here to get your computer back up and running at peak performance. Our technicians will run thorough diagnostics to determine all of the issues, work with you to determine the best course of action, and repair your computer. Franktronics works on all brands of Windows PCs and all versions of the Microsoft Windows operating system. So, whether you’re still running an old Windows XP machine, or just picked up the latest hardware with Windows 10, we can help. Read more about our Virus Removal and Repair Services. At Franktronics TeleComm, we are dedicated to providing the Robust, Reliable communications you need to support your growing business. Our hardware and software experts can custom design a system for your unique application using industry standard hardware and software applications to provide a flexible, reliable system that can be supported for years to come.With our extensive experience with computer networks, servers, and Microsoft applications, Franktronics is uniquely able to integrate communications solutions into your network for increased productivity, billing applications, timekeeping, system configuration and control, and more. Read more about our full line of telecommunications solutions. Read more about On-Site Service. If your computer is able to access the internet, we may be able to assist you remotely. We can connect to your computer via the internet, take control, and diagnose and repair the issue. Not all computer issues are good candidates for remote support, so the first step is to call our office during normal business hours to speak with out technicians. They can determine if your issue can be addressed remotely and walk you through the process of connecting to your computer. Read more about our Remote Support Service.